I’m more a martini boat than a cigarette boat kind of girl. I prefer the back of a big, heavy Harley to a crotch-rocket, and if I’m going to be on a jet ski, then I need nice calm waters and a cocktail. I assumed when it came to paddle boards, I’d feel similarly, preferring the stability of a standard to that of a blow-up. I also assumed a 12 year old dog with a bum knee would feel the same. As it turns out, it wasn’t that cut and dry, and I had way more opinions about the situation than Henri did. If you follow this blog that probably doesn’t surprise you. 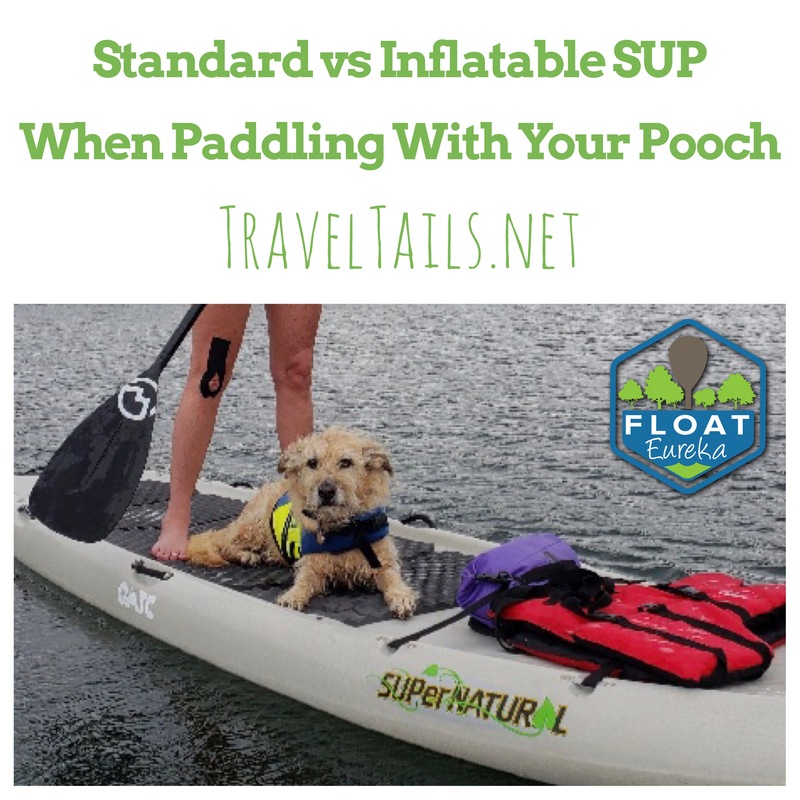 To discover our personal preference and try to figure out what board was best for pooch paddlers, we went out with Rachel from Float Eureka. Located near downtown at the newly remodeled Wanderoo Lodge, this new outfitter has everything you need, including a shuttle to get you to, from, and onto the water. They even rent coolers and sell sunscreen, sunglasses, and floating koozies. *Note: When paddling in Arkansas, you are required by law to have a floating koozie. Our rivers, lakes, and oceans have enough problems without you losing your koozie and can of whatever in our waterways. GET ONE! Float Eureka offers several excursion options, but Lake Leatherwood is about 15 minutes from the Wanderoo. It’s the perfect place to test out your paddle skills if you’re a newbie, test boards without worrying about motor boat traffic, or just enjoy a chill afternoon with your pooch. The Tower Adventurer 1 iSUP is compact, lightweight and easy to assemble. That makes transport and unpacking a breeze, especially for a solo paddler. After pulling it from the storage bag and unrolling it, it took less than six minutes to inflate using a hand pump. Add the fin, and Voila! You’re ready for the water! No help needed with a blow-up and no risk of breaking your toe if you drop your board on it. 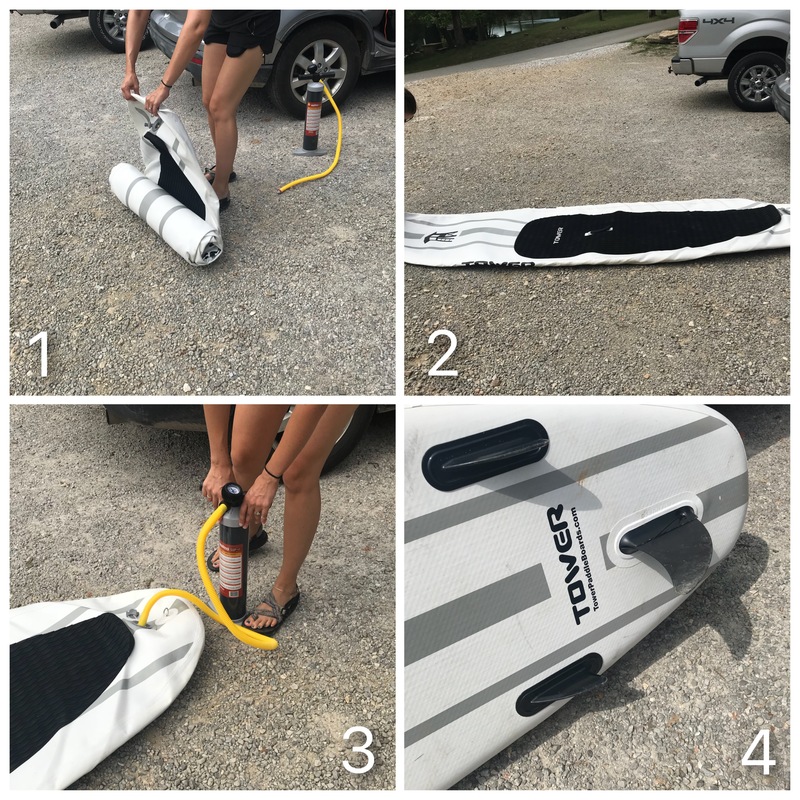 Compare that to messing with webbing, then having to pull your SUP off the top of your vehicle by yourself or carrying 60-plus pounds to the water alone, and this first point is a no-brainer! Since Henri hadn’t been on a paddle board in a while, I decided it would be best to start with the standard. It was bigger, heavier, and I knew it would be more stable. He loaded like a pro, situated himself in the sweet spot, and off we went. 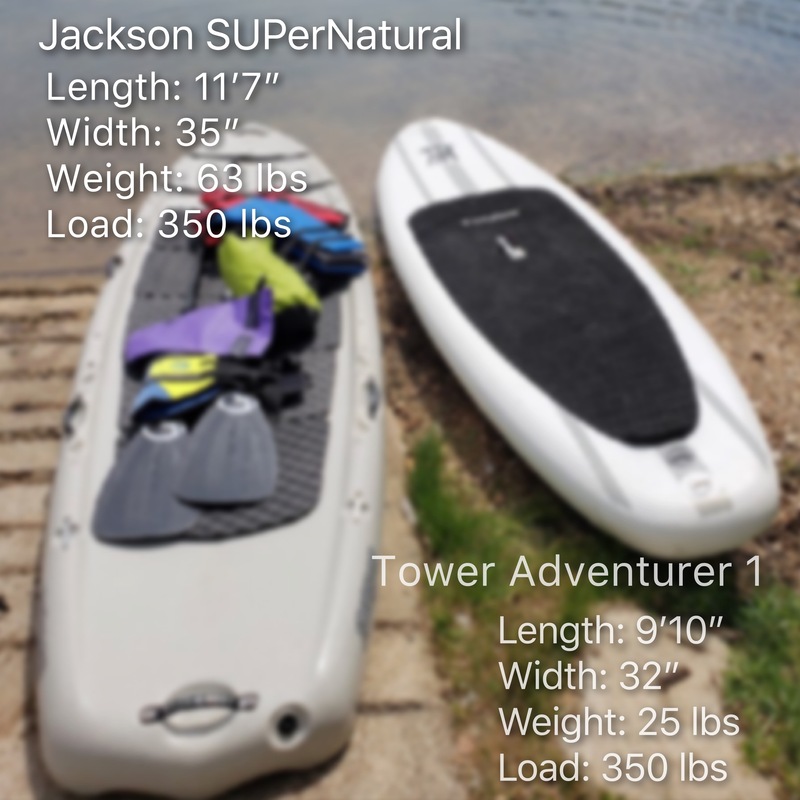 The Jackson SUPerNatural is heavier than the blow-up by almost 40 lbs and sits lower in the water. It’s wider by three inches, which doesn’t seem like a lot unless you need the extra stability. Additionally, Henri’s added weight didn’t seem to make much of a difference in the way I handled the board, and overall, I was much more confident and comfortable on the standard SUP. After paddling around a bit and realizing Henri was as chill as ever, we decided to switch boards and give the blow-up a go. I don’t know if it was Rachel’s mad paddling skills or my exceptional balance (thank you daily yoga practice), but we switched SUPs right in the middle of the lake without incident. Rachel mounted my board first. Then I switched to hers before transferring Henri. Once Henri and I were on the blow-up, it was time to give standing a shot. He wasn’t quite centered and didn’t seem to have any interest in cooperating with my attempted adjustments to his positioning, so this was a delicate process. I managed. The difference in the two boards is pretty drastic, at least in my opinion. The blow-up is lighter weight and less stable, but I found it easier to paddle and maneuver. It also glides through the water much more quickly. Surprisingly, Henri’s added weight seemed more of a benefit than a disadvantage as long as he was centered. If he off-centered or moved, however, it required quite a bit of compensation on my part. Standard boards are probably best for beginners, large dogs, multiple dogs, or dogs who can’t be still. They’re a pain in the arse to load/unload/carry, but they make up for it with stability and roominess. With the extra foot plus in length, I could have easily added my Sportsman cooler and then used it as something to lean against when not standing. Standard boards: Perfect if you’re planning on an hours-long adventure. Shifting from sitting to kneeling to standing is much easier on a standard board. Again, it’s about stability. It’s requires more upper body/core strength to paddle, but it’s less work to balance. If you’re strong but uncoordinated, this may be the perfect board for you. Blow-ups, by comparison, are a lot easier to handle for a solo paddler. You don’t need a roof rack and could probably fit at least two in the backseat of a Mini Cooper. They glide more quickly and easily through the water so if you lack muscle, this is a better board for you. You will need a good sense of balance though. If you don’t possess at least a modicum of that, it could be quite the workout. You’ll later discover muscles that you didn’t know you had. This is the perfect workout board. I’d love to have one for quick trips to the water as part of my weekly routine, but I would not want to spend all day on one. If you have a dog who likes to move around a lot or you have any kind of injury that affects standing joints or your sense of balance, this might not be the board for you. Paddle naked! Or at least barefooted. It’s easier to balance. Keep your head up and your eye on the horizon. Use your core when stroking, not your arms. Start with your pooch situated just forward of the “belly” of the board. That’s the center and your dog should be just in front of you. Make adjustments based on your combined weight and paddle style. Get comfortable. To learn more about paddling, we suggest you give it a try! Call our friends at Float Eureka, or your own local outfitter, and let them get you on the water. If you have questions about introducing your pooch to the board and/or gaining his trust, message me or post a question. I’d love to help you enjoy this great sport together.